Frank Lalli, the former editor of Money and George magazines, has devoted his career to getting to the bottom of a good story. When he was diagnosed with Multiple Myeloma, a rare but potentially deadly blood cancer, he put his reporter's instincts to work and got the wonder drug he needed at an affordable price-thousands of dollars less than he was told he would have to spend. Amazed by the complex and arbitrary nature of the health care system, he decided to share what he has learned so that others can find their best care and save money, too. 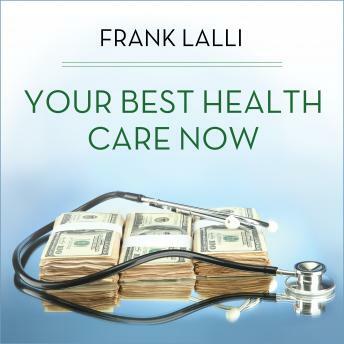 Based on three years of research and more than 300 firsthand interviews with experts, Your Best Health Care Now is your easy-to-follow, real-world guide to making today's health system work for you. You'll learn all the smart moves and timely tips to get better care and save hundreds, if not thousands, of dollars-no matter what your concerns may be. Whether you're trying to book a free checkup or negotiate with a surgeon, looking for an effective generic drug or the best price for a brand-name, or worrying about high insurance deductibles and rising premiums, Your Best Health Care Now has the answers you need to take charge of your well-being.